Weekly, almost religiously, Americans pile into their vehicles and comb their local environs looking for a whole range of merchandise. You’ve got eBayers looking for something they can flip for a nice profit. Then there are the treasure seekers or the bargain hunters. There are lots of reasons why people attend yard sales, garage sales, and estate sales on a weekly basis but no matter their reason, their combined interest means there are plenty of opportunities for making some extra cash. Thanks to digital technology there are lots of places to advertise garage sales, including garage sale apps and yard sale sites to either buy or sell items. Can a Business Have a Yard Sale? If you’re a solopreneur looking to clear some space in your home office or even clear some space in the home for an office, a yard sale can be a great way to do that — and make some extra cash as well. The same is true if you’re the owner of a more conventional business looking to unload some overstock merchandise or supplies. Of course, you won’t get more than a few visitors on a Saturday morning if you’re not advertising your yard sale or garage sale in the right places. Luckily, there are numerous options when it comes to getting the word out. Knowing where to advertise garage sales, yard sales, or estate sales, and publicizing your sale on as many of these channels as possible, will put your location out there to more people and potential customers. And these garage sales app and yard sales sites allow you to sell your products online — locally — while you’re hosting your sale. This app allows you to connect with more local buyers than eBay or other mainstream ecommerce platform but it has a real eBay feel to it. 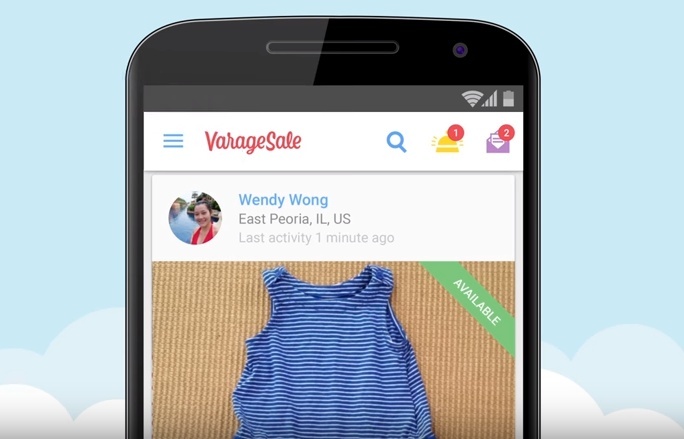 List items, gather followers and ‘watch’ clicks, and even sell from within VarageSale. Whether you are looking to find a deal or sale some of your old treasures, with My Garage Sale (MGS) you can do it for free. 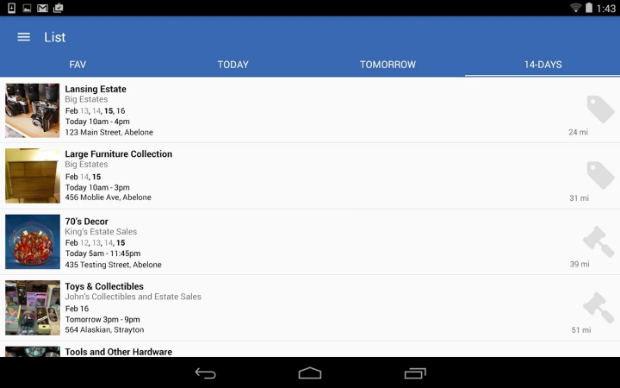 The Android and iOS apps lets you browse locally to find garage sales that are taking place in your area. You can also get notifications when there are sales close by or just browse to see what is available. This iOS app plots local yard sales, garage sales and estate sales against a map so it’s easy to find your way around in your travels from sale to sale. 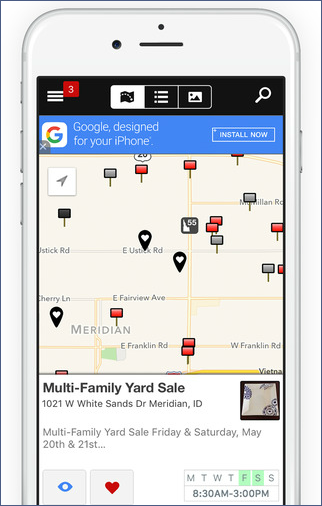 Garage Sales by Map is free to download from Apple. You may need to consider a decent ad if your family is looking to unload an entire estate. At EstateSales.org, a family can purchase an ad for a one-time price of a little under $30. That investment will put your sale in front of a steady stream of viewers at the site and hopefully alert serious buyers. Want to reach a dedicated readership whose main goal is to search for, find and shop at yard sales and garage sales? Gsalr.com says it’s the largest garage sale and yard sale directory on the Web. Create your listing and readers can get directions to your sale along with your description. Post your listing — with plenty of photos and your address — and those locally with the Estate Sales app downloaded to their device will be able to find you and your sale. 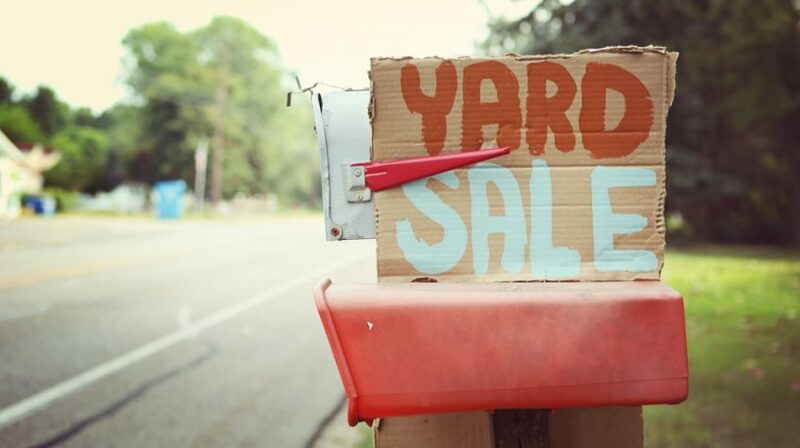 Have a few pieces that you may want to sell separate from your yard sale? List them on an app like OfferUp and try to connect with a local buyer. LetGo is another app that lets you list items individually from your yard sale or garage sale and find potential buyers who have this app downloaded. The app allows you to chat privately with potential buyers to come to an agreed upon price. The Yard Sale Treasure Map mobile app combs Craigslist’s garage sale listings nearest you and plots them on a map to make it easy to find the closest sales to users. 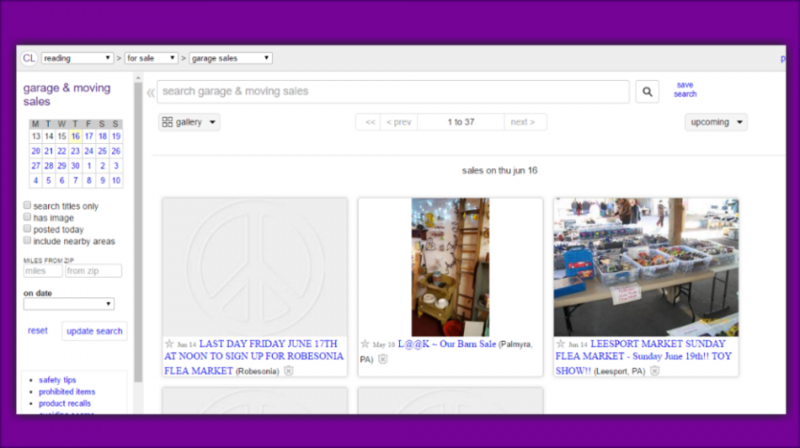 This is another mobile app that pulls its data from Craigslist listings. 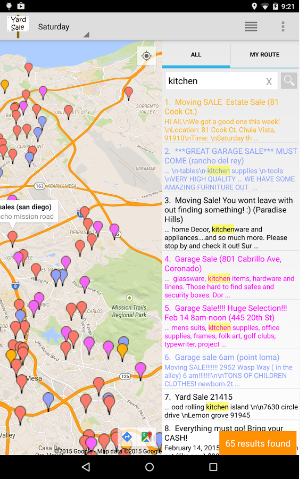 Garage Sales, Everywhere includes photos and turn-by-turn directions using Google. 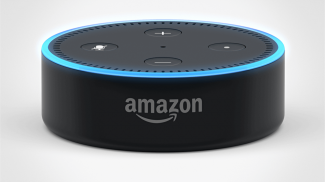 This list would be incomplete without including the source of data for a lot of the garage sale and yard sale mobile apps mentioned here: Craigslist. List photos of the merchandise at your sale and even connect with buyers directly if you list your contact information. The site is also ideal for unloading a lot of stuff that hasn’t sold during your sale. Want to get rid of the rest for free? Take a photo of what’s left and mark it “Curb Alert” and sale vultures will descend upon it. Of course, this list would also be incomplete without mentioning Facebook. It’s easily the most used of any of these sites and apps. Search Facebook for Groups and Pages that are dedicated to listing local garage sales and yard sales in your area. Also, these groups are great places to find buyers. Be sure to include as many photos of your sale items as you can to give readers a good idea of what’s at your sale. And be ready to answer plenty of questions from readers based on your photos. What’s black and white and read all over? To those reading this who are under the age of 30, the answer is a newspaper. And rabid yard sale-rs — if they pick up one copy of a newspaper all week — will grab a Saturday morning copy of their local paper to scan the classifieds for these events. Papers often offer reduced rates for yard sale ads that run in their classifieds. You’ll want to check with your local paper to see what deadlines they have for getting your ad in ahead of your sale. Some even offer little packages for your ads, like free roadside signs or price tag stickers and the like. The last app or site is really a non-app and another low-tech option for advertising your yard sale or garage sale. Some shoppers go rogue and don’t do any planning when it comes to the yard sales they plan to visit on a beautiful Saturday. They just get behind the wheel and drive. Seeing your sign on the side of the road advertising your sale will instinctively draw them in. Also, consider more signs if your home is particularly difficult to find or if road signs are poorly marked or missing. Do you have a favorite app or place where to advertise garage sales? What sort of marketing tactics can you recommend? 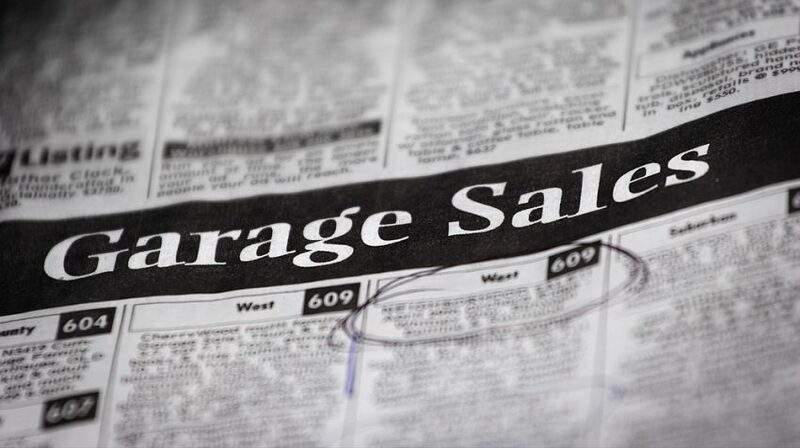 Let us know how you discovered where to advertise garage sales in the comments below. Could these apps work outside the U.S?